Drinking Godello at Estado Puro in Madrid. Photo by Harold Heckle, Associated Press, Madrid. In October, 2015, John Sconzo (Docsconz: Musings on Food & Life) and I led a group on an exclusive tour of Northern Spain, visiting Galicia, Asturias, the Basque Country, Navarra, La Rioja and Madrid. In January 2014, I organized and led the Club Chefs of Connecticut and New York on a culinary educational tour through Barcelona, San Sadurni d'Anoia (Cava country), Valencia, Alicante and Madrid. In October 2013, I led 28 people, including baseball great Keith Hernandez, on The Commonwealth Club of California Taste of Spain Tour with Gerry Dawes 2013 to Madrid, Córdoba, Sevilla, Sanlúcar de Barrameda, Ronda, Granada, Almagro, Toledo and Chinchón, highlighting gastronomy, culture and wine. Gerry Dawes and baseball great Keith Hernandez at the Alhambra in Granada. "Nights like this are ones that just need to be appreciated for the something special that they are. It is no exaggeration that Gerry Dawes, my friend, traveling companion and guide “knows and appreciates Spain more than all but a few Spaniards” let alone people from other countries. That statement came from our host for the evening, Benjamin Rodriguez Rodriguez, the proprietor of the humble appearing, but fully sensational El Rincon de Jabugo situated in the equally humble, but comfortable Gran Hostal San Segundo located just outside the historic walls of Avila near the San Vicente gate." 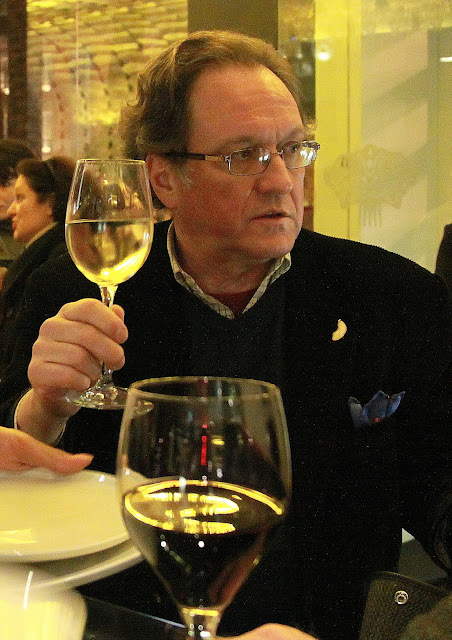 “Gerry Dawes is a true gastronomad, walking the culinary and cultural by-ways of the Spanish soul and then sharing every bit of his passion and knowledge (both considerable) with the reader. I once overheard someone say that James Michener said Gerry was the only one qualified to write the sequel to Iberia. I have learned so much from his experiences -- he is the "go-to" guy for anything authentically Spanish and is unparalleled in his experience with Spanish wines. Gerry has introduced the world to Spanish chefs (including Ferran Adria), Spanish food products, wines, history (I especially love his respect for Spain's Jewish culture -- and he's not Jewish), and travel.” - - Rozanne Gold, Four-time James Beard Foundation award-winning chef and author. For customized trips, contact Gerry Dawes (based in New York) with desired dates, areas of interest in Spain (gastronomy, wine, art, history, culture, photography, etc. ), specific sights you might like to see, number of possible travelers, and an estimated budget for your group. Of all the wines worldwide I love the Spanish wines very much. The food and the wines combined make travelling Spain a great way to spend a few weeks. Thanks, Sujan Patricia and Freight Bob, for stopping by and leaving comments on my site. Please come back. There will be more new articles and photos up soon.